Mythologizing her childhood experiences and perpetuating her own mythology, Esther Pearl Watson’s exhibition Galactic Plains, re-feminizes a masculine world of UFO’s, flying sources, and alien attacks. Through pink, glitter, soft palette, and central vulvic forms that represent spacecrafts, her paintings are reminiscent of her childhood memories. The new series of paintings, created for the occasion of the artist’s solo exhibition at the Gregorio Escalante Gallery in Los Angeles, follow the artist’s interest in storytelling and the focus on narrative art. The solo exhibition in nearly six years, will feature the new series of paintings and never before seen sculpture work as well. Everybody wants to read someone else’s diary. The hidden pages behind the small fake gold padlock for sure hide the most interesting and juicy details about that person’s life. This is not the case with Esther Pearl Watson’s diary. In it, the artist wrote the most boring things, what she ate, what she decided to wear, but would avoid writing about the fact that her father was building spacecrafts in the front yard. 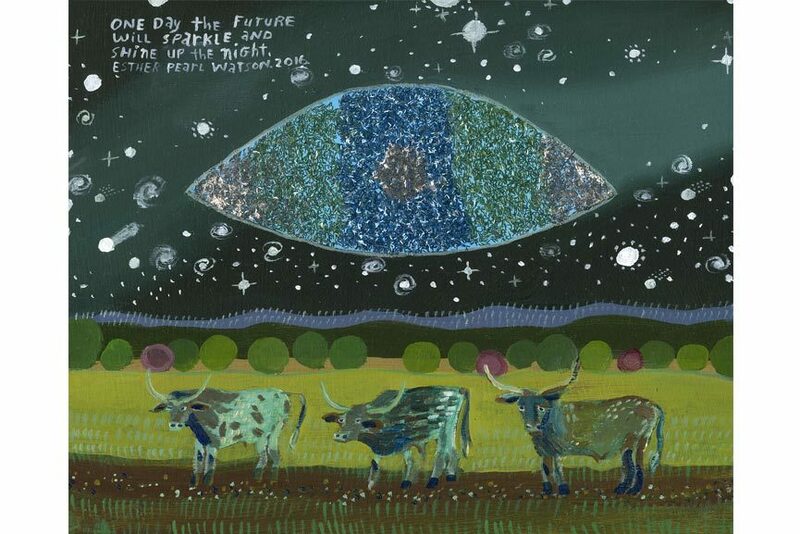 Not afraid to show us this important element of her childhood, that helped shape her aesthetic, often described as folk qua outsider and faux naïve, Watson’s paintings become windows into the past, delving into our own subjective experiences as children, recalling for us the magic that infused that time. 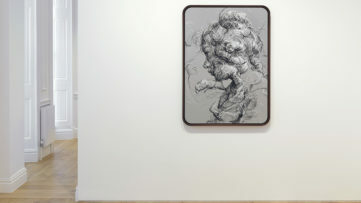 Her work combines images and often short sentences or fragments of a text, written in a child-like manner, that further enhance the deep emotional pull of our own personal feelings and childhood memories. 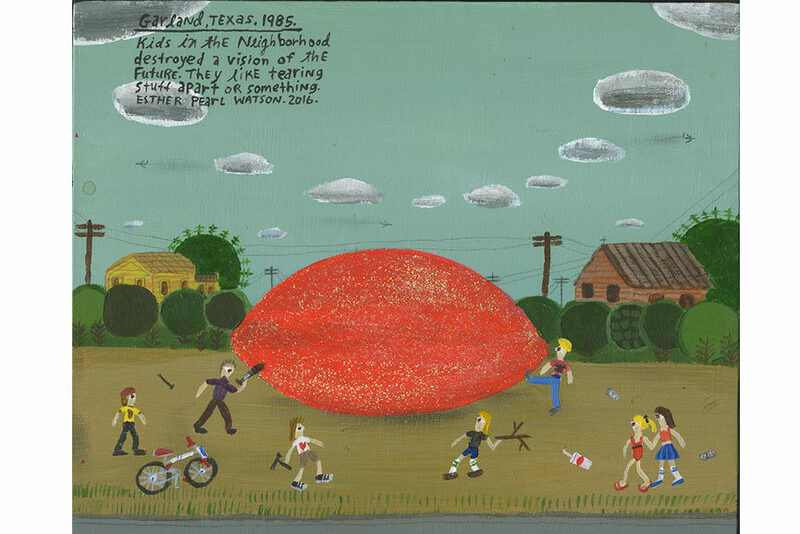 Esther Pearl Watson grew up in the Dallas/Fort Worth area of Texas, moving often as her father’s scrap metal and car engine flying saucers did not sit well with the neighbors. Her paintings are returns to the familiar settings and scenes of her growing up, and are illustrations of specific memories of her often moving and re-entering into new places. 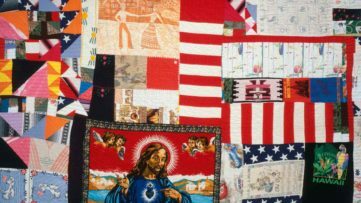 Gas stations, suburban homes outside Dallas, flower fields, and vast roads, are on purposely executed in a seemingly untrained painting style, subjective iconography that blurs realistic and fantastic subject matter, and biographical references. 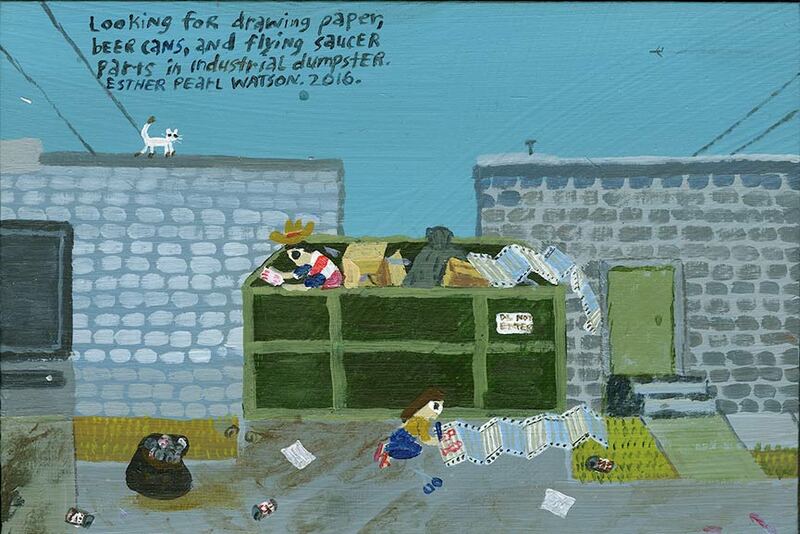 Even though Watson’s paintings look simple, childish, and modest, with the adoption of the outsider art aesthetics they challenge the definitions of contemporary art today. 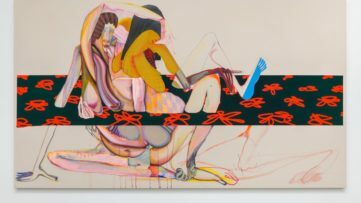 Illustrative and made up of different layers of narratives, at the same time personal and social, her paintings are attempts of reconciliation between the interior and exterior worlds, between dreams and harsh reality, which the artist manages, in the end, to produce for us as a unified and nostalgic vision. 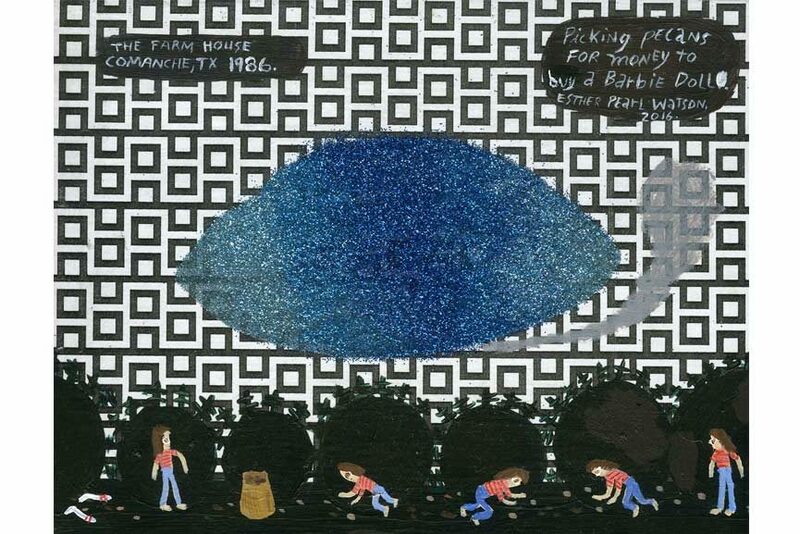 For anyone who has ever felt left out or as being the odd one out, the paintings of Esther Pearl Watson are gentle reminders that they are not alone. 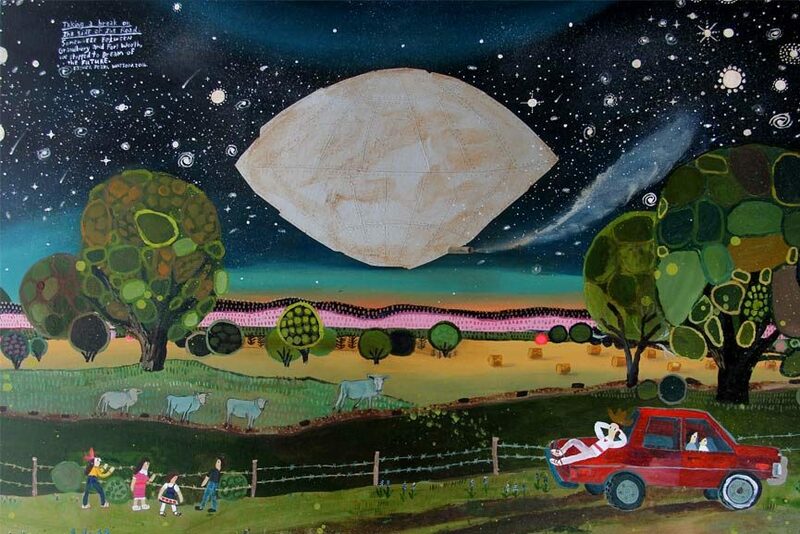 The new series of paintings and sculpture pieces that create the exhibition Galactic Plains will run at the Gregorio Escalante Gallery from May 28th until June 26th, 2016. Watson’s world of UFO’s, spacecrafts, and childhood are for sure reminders that life can be surprisingly magical and filled with fantasy as well. All images courtesy of Gregorio Escalante Gallery. 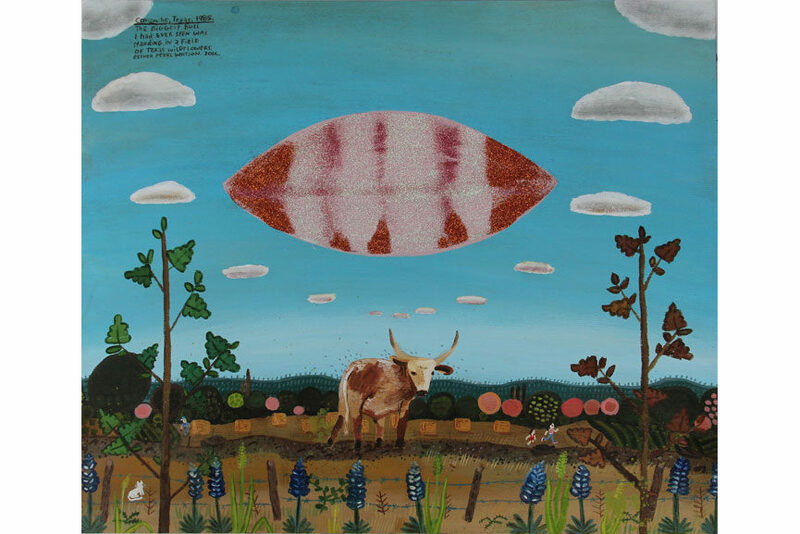 Featured images in slider: Esther Pearl Watson – Drawing Paper, detail; Esther Pearl Watson – Between Grandbury and Fort Worth; Esther Pearl Watson – Barbie Doll; Esther Pearl Watson – Bull in Texas Wildflowers; Esther Pearl Watson – Sparkle and Shine; Esther Pearl Watson – Kids Destroyed Vision.